Most of Lapland lies above the Arctic Circle, and its climate is subarctic. The Land of the Midnight Sun and the home of Santa Claus is very cold, with snow-filled winters for 180 to 220 days, though the brief summers can get fairly warm. The sun doesn't set for 73 days, in summer. In winter, the sun doesn't rise for 51 days. The spectacular and famous Northern Lights (aurora borealis) can often be seen in winter. Winter sports are a huge draw. Lapland has many ski centres, including Yllas, the country's largest downhill ski resort. Lapland is reindeer country, and home to elk, foxes, bears, lynxes, and many bird species, including the golden eagle. Southwestern Lapland is overflowing with rivers and is rich in flora. The eastern and central areas have pine forests and tree-covered moors. The north is rather barren, with sparse and stunted flora. Lapland has a small Sami (Laplander) population that has inhabited Finland from time immemorial. Many of them still roam Lapland, living by reindeer herding, hunting and fishing. But most Sami families have long been assimilated into mainstream Finnish society. The Sami people comprise less than 5% of Lapland's population. Although it can be a harsh environment, Lapland offers adventure in the midst of a lovely subarctic wilderness. Its biggest towns are: Rovaniemi, the provincial capital; Kemi, known for its snow castle and Arctic icebreaker cruise operators; and Tornio, the oldest city in Lapland. To many Finns, the group of mountains northeast of Rovaniemi, known as the Korvatunturi, is where Santa Claus lives. Just 8 km south of the Arctic Circle, Rovaniemi is Finnish Lapland's administrative and economic centre. 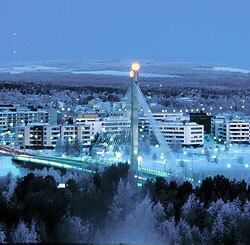 The University of Lapland and the Rovaniemi Polytechnic are based in this city. Situated where the Ounasjoki River meets the curve of the Kemijoki River, Rovaniemi and its surrounding areas have been continuously settled for millennia. Because of its position at the rivers confluence, Rovaniemi is a major gateway to the unspoiled wilderness of northern Finland, and is close to the Santa Claus Village, which receives thousands of visitors every year at or near Christmas time. The Village is half in, half out of the Arctic Circle, and tourists love having their pictures taken while straddling or stepping over the demarcation line set in the ground. Many visitors come to Rovaniemi to explore Lapland, to hike the forest trails or ski down the slopes of Ounasvaara, or to witness the Northern Lights, or to enjoy the subarctic and arctic flora and fauna of the region. The delicious orange fruit known as the cloudberry grows so profusely here in season that a Cloudberry Market is held in nearby Ranua every August. Also in Ranua is a wildlife park where over 50 species of Arctic animals live . Cultural attractions in Rovaniemi include theaters, museums, galleries, and events such as the Jutajaiset Folklore Festival, a celebration of Sami song, theatre and dance.